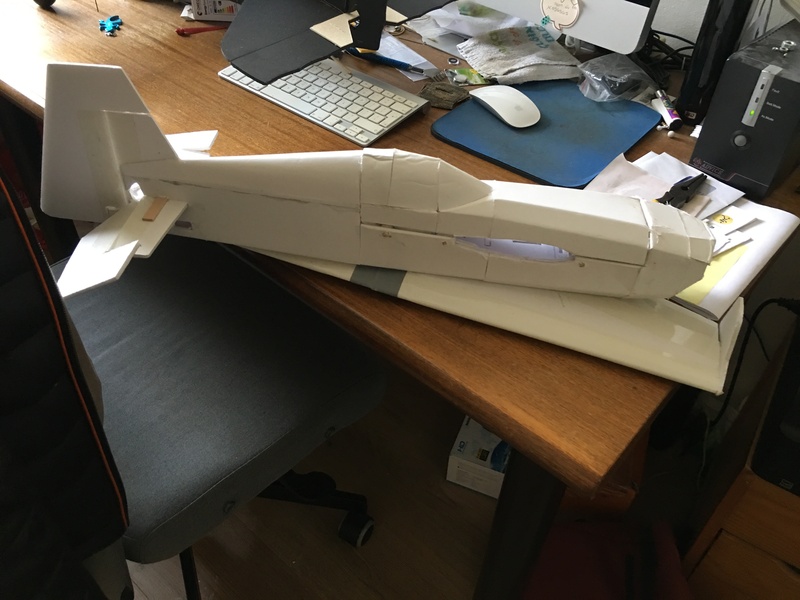 Today I have decided that’s time to end the journey, the journey that I started when I first meet FT and started learning to fly RC planes (https://forum.flitetest.com/index.php?threads/hobby-newbie-learning-diary-family-included.54910/). It’s been one hell of a journey, one that I will never forget, but I think it’s time; it’s time to end that journey and start this one. This journey will be the second part of my journey into this wonderful hobby. It will be all about the things that I have worked on and things that I am working on; doing, building, and flying. Some of the content will be linking to other threads, for example build threads, other content will be posted here so stay tuned because one way or the another it will be exciting! @FDS you know me and can sure as hell bet that there will be some more great stuff coming soon. Ok so I’ll start off be linking back to my very first model modification project the SpiTTT. For those of you who don’t know the SpiTTT is a Mighty Mini Tiny Trainer (TT) modification that turns the TT into a warbird. It changes the flying characteristics of the TT by adding some edginess to it but still provides a very comfortable to control plane. If you feel comfortable flying the TT with a 4 channels setup and haven’t flown any other model I highly recommend you try this modification. You can either build a fresh build or even take an existing TT airframe and convert it into a SpiTTT. It’s been awhile since I took my SpiTTT flying and recently brought it out to the field with me. I had to try something different this time though so I beefed up my power system changing the original setup it had which was the exact setup that the TT is using; to a 9x4.7 prop, a B pack motor, a 30A ESC and a 3S 1000mah battery. Yes it’s possible to do that even with the original TT build. 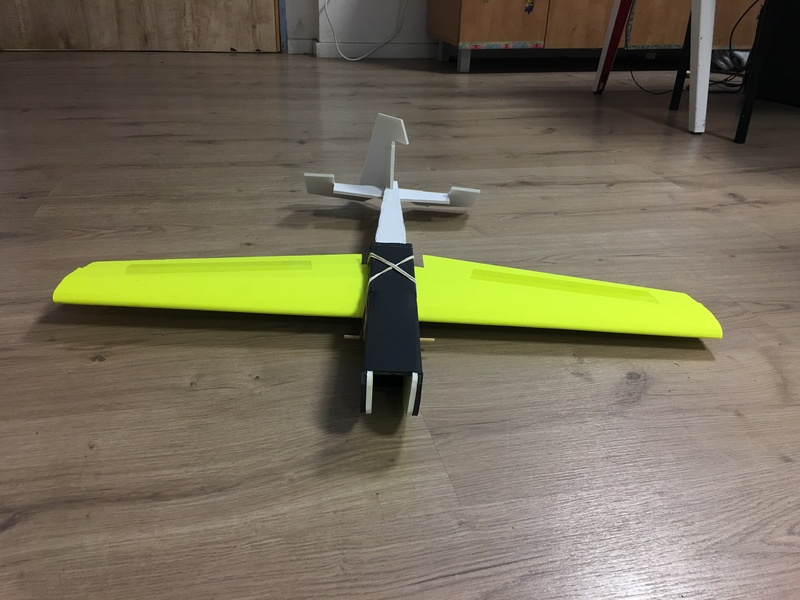 You can read about how here: https://forum.flitetest.com/index.php?threads/larger-power-pod-for-tiny-trainer.57826/. I flew the SpiTTT with the new power system and had a blast the plane was still very easy to control and could still fly very slow, thus I decided that it’s coming with me again the next I go flying. Here is a short video of my the last time I went with it to the field which was the first time after a long and with the new power system excuse me for the bad cameraman it her first time filming a flying plane. I noticed that the bird went in nose first! Actually it looked a little like the dreaded LOS as it stopped trying to maneuver once it started its downward trajectory. My question is with the larger power pod was there any real damage and did the skewers rip as they would have if using the original mini power pod. The larger pos shares its impact loads with the nose reinforcing/cheeks so it would be nice to know if the damage you experienced was less, more, or about the same! Good luck with your continued journey!! The damage would have been pretty much the same if I hadn’t have reinforced the BBQ holes using poster board . Quick update. I am falling behind on the projects that I am working on, so I stole my wife's night shift to get on top of things . Tonight I plan to finish scoring and marking the Mini Edge long term plans that I have created, start building the Quick Trick @Hai-Lee recommended I build, finish my TT/Edge crossover build while taking notes in regards to updating the plans. I think that's enough for one night shift . Generally what should you expect to see in the near future on this thread? You'll hear more about my Mini Mighty Mini TT project, the Mini Edge 540 project, and the TT/Edge crossover project all with their own build threads. You'll live with these for now since I don't want to spoil some suprises that I have lined up for this next journey of mine. Decided I’d post an update before I went to get some sleep after my night shift which is over and in which I have managed a lot. So what did I manage to complete? I finished scoring and marking the long term plans of the Mini Edge, so now I can easily build another one and label it my final version. The same version which will sum up this thread: Mini Edge 540 Build, that is dedicated to the Mini Edge 540 build project. More about that project here when I finish the building and maidenning of the final version and wrap it up with a sum up post on the original build thread. I finished creating another modification to the one and only TT it’s called Tedge. What is it? It is a modification that was created because of a forum member that goes by the name of @BorisTheSpider. Who looking at my Mini Edge 540 Build thread got a bit disappointed that the project was just a resize of the original version and not a TT/Edge crossover. So thank you man for putting that snowball on the top of the hill and letting it roll . You’ll be able to read more about this model after I maiden it and open a separate thread dedicated to it’s build. One thing you can be sure about though, and that is that this baby is going to participate in this crazy *%^]% *%?€ challenge: Getting Stupid with the Tiny Trainer - The Challenge. Ohhh and there might be another surprise in for it if it flys really well . I managed to fix the very first version of the Mini Edge that I build it was a 60% scaled down version (the size of the mini scout) that worked with an f pack motor and 7x5 prop. That version taught me a lesson about how not to burn ESCs by creating too high of amp draw and figure out how to choose the right prop/motor combination. I plan on giving it away to the 8 year old that I took to the field the last time I went. I decided to stick with a 75% scaled version as the final version for that project because it’s size was much like that of the TT which I felt comfortable with. And I started working on the Quick Trick build. I think that’s enough for night. That thing looks amazing! I can't wait to see how it flies for you. And further, can't wait to see details on its construction! I may get the credit for criticizing you but you get all the credit for taking it in stride and running with it! @mayan - you have been on fire for a while and now it looks like there is a wind fanning the flame - watching and learning from Wellington New Zealand! @mayan, I haven't forgotten you, my brother. Love. I'm having some health issues, and just trying to keep up with the Alerts to my posts is pretty much all I can do. I'm not even doing well with that. You've a beautiful mind and a wonderful spirit. If I don't like or reply, please don't take it as ignoring you. I am not. I was hoping to fly on Thursday and I honestly don't know if I can even walk into the field. Please put me in your prayers, just as you and yours are in mine. I posted this publicly, rather than in a PM. I wanted everyone to know just how much I respect you and what you are doing, and that I have not forsaken you. You ARE a Mentor in the making. As you know, I've a pretty strong belief of just how high a bar that is. It'll all be good. I have faith and it will all be good. Meanwhile, if I don't seem to be there all the time, don't stress it. I AM there. I am there with you, with every flight. Just like you are there with me on mine, and you know exactly what I mean! I'm very sad to hear that you're not well, I hope you'll have a fast and complete recovery. So we can get more awesome vids of you flying!! Mayan what size electronics are you going to use in the T'Edge? I haven't fully decided on that yet but this is probably what I'll go with. 6x4 prop, f pack motor (2204), 20A ESC, and try to balance it all with a 3S 800/1000mah batteries. Stole another night shift from my wife, to finish off a few things. What's on the plan for today? Finish adding all the electronics into the Tedge, continue building the Quick Trick, and solder some electronics. I hope the weather prediction stays as is, that way I can go to the field on Saturday, hope to get the entire family to come and have my wife film the entire thing. I have a few planes that I want to take with me to the field and some that I still need to check to make sure that everything is working properly. On the last order I made I purchased a few batteries so that I will have more flying time, some arrived and some are due to arrive very soon. Hoping the rest will arrive before Friday, because then I'll have plenaty of batteries to fly all the models I want to take with me to the field. I want to take the Mini Edge V2 (my new trainer plane), the TT, the Mini Mighty Mini TT, the Mini Scout, the SpiTTT, the Tedge and if I finish the build also the Quick Trick. PS- I want to say a special thanks to @kilroy07 who took me up on a challenge of building the Master Series Crossair, and so kindly enough sent me a cutout kit. So @kilroy07 thank you so very much. Can't wait for the package to arrive and for the challenge to begin . In to witness the new journey. I was there for the first one, so don't expect me to take a back seat. You know what I want to see? You taking a plane off the ground, flying a pattern, and landing where you took off from. One full circle. Similar to the challenge @Hai-Lee gave you about flying straight and level making shallow turns. Happy you joined my new journey, promise you it will be just as fascinating as the previous one . I remember that video well , that's what made me want to learn ground take offs and landings so bad. Don't worry though I still have the Simple Scout in good flying shape it's only missing the electronics which I have moved to the Mini Edge V2 and V3 to be able to continue with that project. I have received new electronics so have to place them back in. So @Arcfyre back to my promise about being fascinating, ground take offs and landing are on my need to achieve journey list, with it's own dedicated tips and tricks post . I guess, most importantly though, I got off to a pretty negative start with this hobby and was going to quit and chalk it up as just another reason to be ticked off at life, but the super helpful, easy going, fun-spirited community here helped me out and made the learning process bearable and gave me a reason to keep plugging away at it. I still have my issues but I'm in a much better place with this hobby than when I started and actually starting to get some real enjoyment out of it and relax a little. At the very beginning, I was a lot less receptive to advice and criticism than you have been, and if I'd tried some of the stuff people were advising me to earlier, I'd probably be farther along, at least in some ways, but some of those hard and fast lessons with early home designs actually taught me a whole lot in a short span of time. I'm looking forward to seeing where the journey takes you and exchanging knowledge and ideas! Best of luck! @Vimana89 where have you been buddy? I haven't heard from you in a long time. PM me I'd love to hear more about what you've been flying. Too bad you missed my other thread, it might have helped you with the learning. Any how stick to this one it will be interesting .